Pioneers in the industry, we offer centre aperture opening valve (iris valve), iris valve for jumbo bag and pneumatic operated iris valves from India. 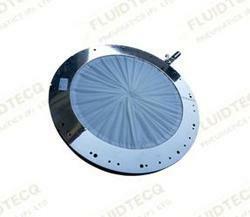 FLUIDTECQ IRIS Valves are available in Aluminium alloy, SS 304, SS 316 and SS 316L. It is designed specifically to handle dry bulk solids for gravity discharge from bins, hoppers, bulk bags, etc. Iris valve is an inexpensive, lightweight, compact valve which can be installed on bulk bag dischargers. On a bulk bag discharger, the valve shuts off the bulk bag’s spout without directly contacting the flowing material, while in other applications the valve directly contacts the material. Available in Aluminium alloy, SS 304 and SS 316 AND SS316L. It is designed specifically to handle dry bulk solids for discharge from bins, hoppers, bulk bags, etc. The diaphragms are available in Nylon or PU coated Nylon. An optional feature is a guide sleeve passing through the orifice of the diaphragm; hence the material will not be in contact with diaphragm which helps in increased life of diaphragm. •Full bore opening offering free flow of product without any restriction. 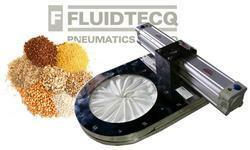 •Ideal for dry bulk solids like powder, grains, pellets. •No Jamming of any parts. 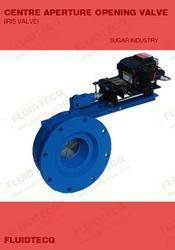 Looking for Iris Valve ?